Practice your break, but be willing to change your approach. Anybody who has seen me play knows that I�m a stubborn player. I have a tendency to stick with my plan, even if it is clear that the plan isn�t working. That is particularly true with my break shot, which, ironically, is the worst part of my game. I stay with the same break and I fight change. In a match at the Chinese 8-ball tournament earlier this year, I was breaking the balls full in the face. I was breaking well, but because the pockets were really tight, I wasn�t making a ball. It was alternate break, and I was down, 5-0, before I finally made a change. Good players make adjustments. I almost waited too long. I realized I had to shake thing up to change the pattern of play. I decided to break from the side and hit the second ball. It left more clusters and confusion, which is better than giving your opponent the table with an open rack. The games turned from run-out to a grind. At least it gave me more time at the table, and eventually I was able to get the rack back in my favor. My approach became more tactical and it changed the momentum. After I fought back, I started breaking from the center again and it started working. I was able to run a few racks and eventually won the match. The key, of course, is the willingness to change. That holds true for all games, but it holds true especially when it comes to the break. If your standard break isn�t working, be ready to change. That doesn�t mean scrapping your normal break after one or two games. It means being able to recognize when a change is needed. I suggest to all players that you practice, not only your main break, but also practice a secondary break. The mere habit of practicing a secondary break helps you get away from the mentality of stubbornness. And because the break is the weakest part of my game, I practice it a lot. Let�s face it. The break is a critical part of the game. When I�m breaking well, my whole game seems to be at a higher level. When I�m not breaking well, it affects my confidence and that affects my timing. The process of racking and reracking balls so that you can practice your break is a problem, so I use a break rack. It allows you to practice your break without having to rerack the balls. I use it 20 minutes a day to get my timing and power down. The break should come natural, but it seems that it is something that you either do well naturally, or you struggle. 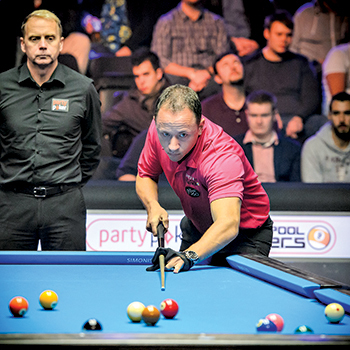 Top players like Shane Van Boening and Dennis Orcollo have consistently great breaks. I�ve always stressed to students that watching the top players is a great way to learn. This is true when it comes to the break as well. I always try to study the players who break well to see what they are doing differently. One thing that I�ve noticed is that timing is so important on the break. Consistent timing comes from hours and hours of practice, until it becomes muscle memory. Alex Pagulayan always says we have a pool muscle in our arm! It is pretty universally accepted that Shane is one of the best breakers in the world. He practices the break more than anyone I know. He sets up the same as everyone else, but on his backswing he dips his shoulder a little, which allows him to come through the shot with his cue on a level plane. Coming through flat keeps the cue ball from bouncing back off the rack and still avoid the scratch in the side pocket. Just knowing that doesn�t mean you will all of a sudden break like Shane. It�s a timing thing, and his timing comes with an incredible amount of practice. Additionally, Shane really studies the break, and he�s a genius at it. His knowledge of reading the rack and knowing where to place the cue ball is incredible. We were teammates in the Kings Cup in the Philippines. After the referee racked the balls, Shane would inspect the rack to see where the gaps were. He would tell me exactly where to place the cue ball. I never broke from the same place twice. Finally, when you are playing a match, you should watch your opponent�s break. If he�s breaking from a certain spot and getting a lot of action on the balls, and if you are not getting anything to drop on your break, you have to consider following his lead. Don�t be afraid to admit that your opponent is breaking better than you. You still want to win, right? Use common sense. The break shot needs to be practiced often, and no one works harder on the break than Shane Van Boening.